If you have any additional questions, please give us a call and we’ll be more than happy to answer them! How will Movers On Duty Protect My Furniture? We are very meticulous to secure and protect all of your furniture and belongings with blankets and/or plastic-wrap during transportation. 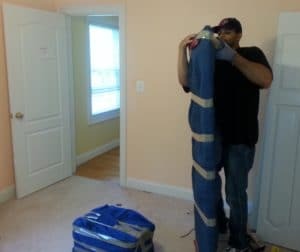 Will Movers On Duty protect my TV(s), paintings, and mirror(s) before moving them? How will my bed(s) be moved? 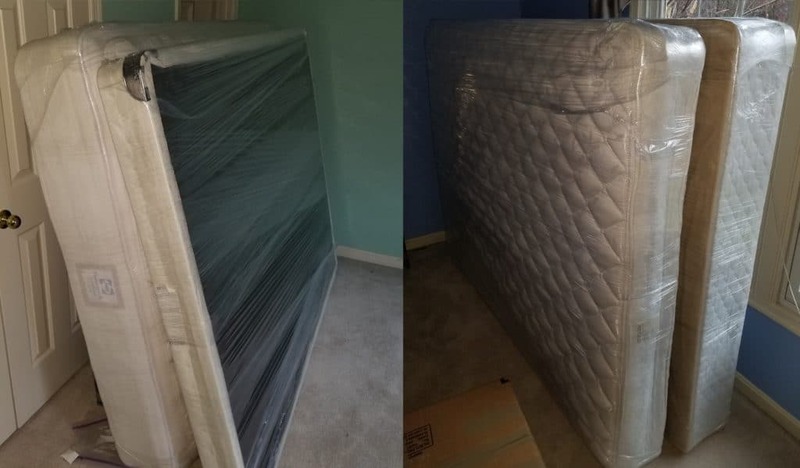 We are going to plastic wrap your mattress(es) and box spring(s) at no additional charge. Headboard, footboard and bed frame will be blanket wrapped to avoid nicks, dings or scratches. What will be loaded first? In what order do you pack the truck? It really depends on what exactly we are moving. In a regular residential move, we start with all the boxes, plastic bins, luggage, and plastic bags. All square/rectangular furniture items will be loaded next (dressers, nightstands, chest of drawers, etc) Then odd-shaped items like chairs, bed frames, and floor lamps. We will usually load mattresses and box-springs last, placing them as a wall to help us secure the load. We use tie-down straps to make sure nothing moves while in transit. If you didn’t complete the packing, maybe because something unanticipated took you away from packing. 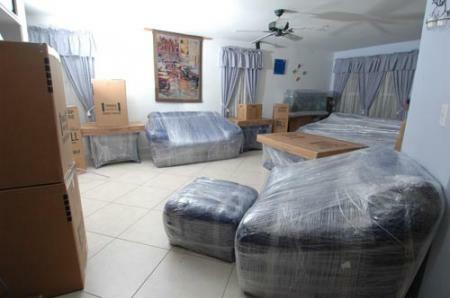 Contact us as soon as possible so that we can send out professional packers to complete the job for you. Everything must be packed in boxes, plastic bins or bags before entering the truck. 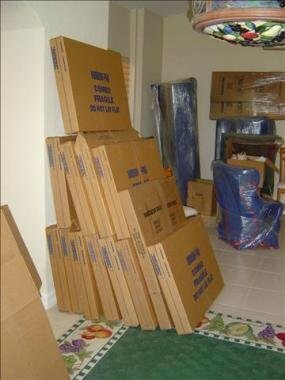 We have very affordable packing rates and we will provide ALL packing supplies AT NO ADDITIONAL CHARGE. Make sure your home is ready for the crew. Move anything off the porch and walkways that may obstruct movement of your goods out of the home. Take doors off the hinges if you know certain items will not fit through. Remove all small area rugs from traffic areas that could cause the driver or crew to trip or slip. Have water, Gatorade or soda on hand for the movers, especially on a hot summer day 🙂 They will come prepared but will be grateful for your thoughtfulness. Can you dis-assemble/re-assemble my bed frame? It is a simple metal one, I just don’t have the tools for it. The stairway is a bit too narrow to fit a Queen size box spring (mattress can bend, so it’s ok), but to get the mattress out of the room, it needs to be lowered via rope from the balcony attached to my room. 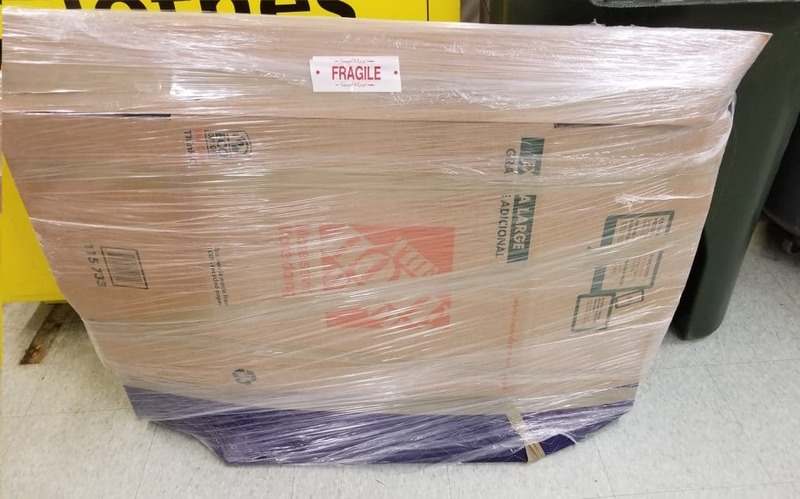 Is this something your movers can take care of? Yes, we can but there is an additional fee for this. This allows us to bring an additional helper and special ropes to get this done correctly and safely. Our delivery time for long distance shipments is usually 1 to 14 days depending on where you are moving to and the time of the year. If you need an exact delivery date simply let us now. Your driver will contact you 24 hours prior to delivery with an ETA. Be certain to provide the driver with all your updated contact information. The phone number at the new home is only good if there is a person there to take the call. If you can be reached at work, a hotel or temporary residence or by email let the driver know. If you will be impossible to reach, make arrangements with a friend or family member to serve as the liaison between you and the driver and provide the driver with that contact information.